Is there any chance to held on 27th April? Can SSC conduct re-exam on pre-scheduled date? Well, we will say yes! SSC CGL 2013 Tier-I re-exam will be held on 27.04.2014. There is no problem for SSC to conduct re-exam on previously scheduled date on 7-selective cities. After 27th April, if the court says to conduct the re-exam on some more centres or in whole country, then SSC can able to do so. No, problem will be occurred. But all final decision must be done by the court only. SSC has no right to make a final decision as it is a court's matter. So, it can be expected that CGL 2013 Tier-I re-exam is going to be held on 27th April. What will happen if any cheating case found while re-exam? If it is found that some candidates again cheat in the Tier-I re-exam and it is proved, then the court may order SSC to hold the re-exam in pan India from the beginning stage (i.e. from Tier-I). But after this type of cheating, SSC will be very strict and careful while organizing any exam in near future. So, we can hope that such cheating would not be happened. 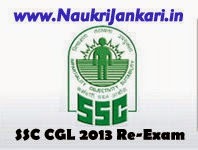 Many of our readers asked us - what is the future of SSC CGL 2013 exam? Will the recruitment process finally completed? Well, as this case is under the court, we have no right to spend a single word about this matter. But we can only say that until it is under the court, it has no future and we can not expect anything from SSC CGL 2013 exam. We pray that the court would give final decision soon in favour of all genuine candidates so that their dreams come true very soon! Please Note: It is our fully personal opinion. SSC didn't publish such type of notice saying it. 3 comments for " Will SSC CGL 2013 Tier-I re-exam be on 27th April: Analysis "
jo SSC tier 1 me pahle fail ho gaye the they are also eligible for this reexam..? ?